FC Nova tasted defeat for the first time this season when they lost to Golden Boys in Bangkok last Saturday. The technically gifted Bangkok side certainly deserved their victory, however a sterling second half fight back by Nova nearly snatched a point and coach Stuart Levy could be proud of his side as they gave their all against undoubtedly the best team in the division. Nova had assembled a strong 15 man squad to travel up to Bangkok and Levy made two changes from the previous week’s victory: Paul Derbyshire and Sit Namthong being brought back to bolster Nova’s attacking options. 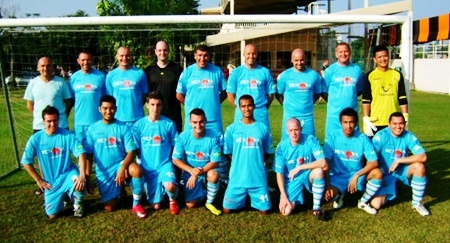 FC Nova line up prior to their match against Golden Boys in Bangkok last weekend. In fact the visitors made a decent start to the game and will rue the fact that they missed a number of glorious chances early on to open the scoring, that on reflection proved crucial to the final outcome of the match. Bjorn Ellingsen, Derbyshire and Namthong all blazed balls over the bar with the best chance falling to defender David Booton who saw his free header from a Namthong free kick brilliantly saved by the Golden Boy keeper. It was not long however until Golden Boy found their feet and their flowing one touch football had Nova at time chasing shadows, so much so was their dominance, Levy soon changed the formation of the side, packing the midfield in a desperate attempt to get some control of the game. Nova also did not help their cause by giving the ball away too cheaply against a side that retained possession of the football so well. It was real back to the walls stuff, and Captain Lee Homer and his defence were working overtime to keep the Golden Boys attacks at bay. To the large part they had done their job, along with excellent Mark Mckeowen in midfield. By getting numbers behind the ball they managed to limit the number of clear cut opportunities that came Golden Boys way. However it was taking its toll on a number of Nova’s players and coach Levy was forced into making a number of substitutions due to injury or sheer exhaustion! Finally Nova’s resistance was broken with five minutes remaining in the first half; they found themselves cut to pieces down the right flank and a quick succession of one touch passes allowed the Golden Boy striker the simplest of chances from which he made no mistake. Soon after Nova found themselves two down after another flowing move, this time down the left side, saw the ball cut back to the same Golden Boy player to drill home. Moments later the half time whistle blew and the home side must have been confident in extending their lead in the second half after giving the Pattaya based team a sharp lesson in football for most of the first half. Although physically drained and with a number of Nova players carrying knocks, coach Levy rallied and patched up his troops. One thing you can certainly say about this Nova side is they have guts and determination in abundance and they brought this to the fore in the second half. They finally managed to get their passing game going and kept the ball so much better than they did in the first half, with Mckeowen and Roger Cox in the centre of the park closing the Golden Boys talented midfield down a lot quicker, snapping at their heals at every opportunity. It unsettled the home team and the visitors soon found themselves on top of a game that for the large part looked out of their reach. Chances soon came and with twenty minutes remaining they deservedly pulled a goal back. Nicholas Creasey cleverly threaded the ball through to Derbyshire who was upended inside the box. Captain Lee Homer, who had been outstanding in the second half, confidently stepped up to fire home the penalty. With ten minutes remaining Nova should have been level when the tireless working Derbyshire rolled the Golden Boy centre half before putting Namthong through on goal but the striker sent his shot agonisingly wide of the post. Nova laid siege in the dying minutes forcing a number of corners, however they failed to capitalize on these and were soon made to pay when the home side broke away to score a third goal and seal their victory. For the neutral it was a great game of football to watch and Nova and coach Levy will certainly take heart from their battling second half performance. 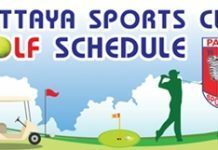 Also it will be a day for every football fan to put in their diary when Golden Boys travel to Pattaya for the return fixture. Win or lose the Nova players and management certainly know how to party and they travelled back to Pattaya in buoyant mood and were soon seen living it up in a packed Jamesons Irish Bar on Saturday night! This Saturday Nova hopefully have a cup fixture in Bangkok but at this point in time are still awaiting confirmation from the league as to their opponents.